The state representative discussed current legislation being circulated and listened to neighbors’ concerns. 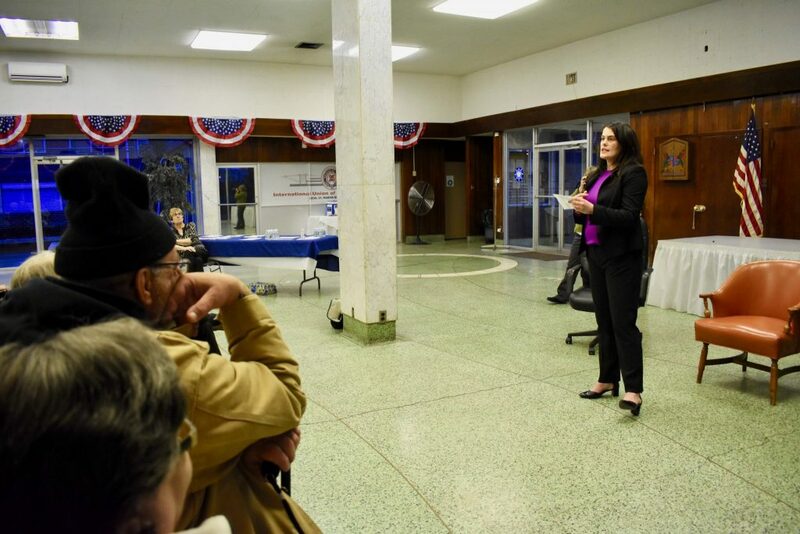 South Philly residents gathered at Seafarers International Union, 2604 S. 4th St., last week as state Rep. Elizabeth Fiedler (D-184th dist.) delivered updates regarding legislation in Harrisburg and listened to local community concerns, specifically from neighbors living in the Whitman area. Before delving into questions from residents, Fiedler, who assumed office in January, discussed various policies she’s currently working on at the state capital, particularly noting counter efforts from other representatives. Fiedler says she’s working to both retain and reform General Assistance, a state-funded program that serves certain individuals who do not qualify for the federally funded Temporary Assistance for Needy Families benefit. These low-income individuals include victims of domestic violence, individuals receiving approved drug or alcohol treatment and adults with temporary or permanent physical or mental disabilities that prevent gainful employment. Last week, Fiedler spoke on the House floor about the importance of pregnant women and people with mental illness having access to the program, which is currently facing a potential repeal by Republicans in the state legislature. Fiedler is also advocating for a statewide “Fair Workweek” legislation, which was passed by City Council in December. The concept aims to provide predictability for employees working at big box stores, as the law would require such companies to release workers’ upcoming schedules two weeks ahead of time. Along with pushing for net neutrality, the notion that all internet service providers should not discriminate against certain online data, and wage theft reform, ensuring that workers receive their legal and contractual earnings, Fiedler contributed to legislation unveiled last week that would benefit incarcerated women and parents in Pennsylvania. She specifically sponsored bills in the legislation that would establish both an ombudsmen program, which protects inmates from biased treatment after filing a complaint, and a reentry mentoring program, allowing incarcerated individuals to receive guidance from people who were already released. Although the measure is still in its infancy, Fiedler also says she’s working on legislation that would make sure individuals struggling with drug addiction, specifically opioids, receive the support they need. Similar concerns were echoed by meeting attendees. Several residents of the Whitman area say they’ve noticed drug paraphernalia, such as syringes, littering local streets, including around the GoodWill, located at Front and Shunk streets, as well as under Interstate 95. Other says they’ve seen paraphernalia around schools, including Francis Scott Key School, Stella Maris School and South Philadelphia High School. Witnessing the littered paraphernalia, Whitman resident and recovering user Jimmy Paylor says he’s currently working on a neighborhood-based program that would not only start neighborhood cleanups but would support individuals in recovery. As far as crime, residents also voiced concerns about demanding more police presence in the neighborhood and lack of proper street lighting. Residents say they’ve noticed improved and increased lighting in more gentrified areas. Along the lines of shifting and displacing populations, residents brought up the rising concerns of language barriers between neighbors. But, Fiedler underscored her office’s objective to represent every resident of her multicultural legislative district.